Forward any and all resolutions that you, your committee, or your club wish to have brought forth at the 2016 BC Athletics AGM by the deadline on Monday, October 3, 2016. All resolutions submitted by the October 3, 2016 deadline will be reviewed by the BC Athletic Board of Directors and resolutions to be brought forward at the 2016 BC Athletics AGM will be posted on the BC Athletics website no later than October 18, 2016. This workshop is required for advancement to Level 2 in the Athletics Canada National Officials Certification program. Please register for the sessions you wish to take part in. BC Athletics Annual Awards Deadline! Just a reminder that the 2014 BC Athletics Annual Awards nomination deadline is fast approaching. You have until Sunday November 2, 2014 to get your nominations in to the BC Athletics office. Annual Awards information and nomination forms are available on the website. The 2014 BC Athletics Annual Awards Banquet will be held Saturday, December 6, 2014 at the Hilton Vancouver Airport Hotel in Richmond. Get your tickets early – last year we sold out one week before the banquet! 2014 BC ATHLETICS ANNUAL AWARDS !! Nomination forms for the 2014 BC Athletics Annual Awards are now available on the BC Athletics website. Full details for the 2014 BC Athletics Annual Awards Banquet will be available shortly. 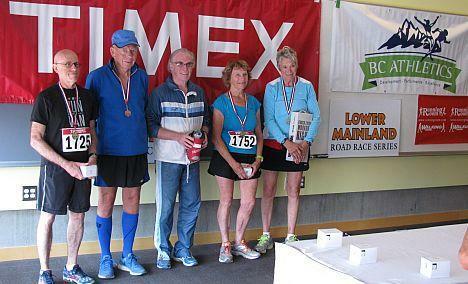 The 2014 Lower Mainland Road Race Series concluded on Sunday. Bookended by the Steveston Icebreaker 8K and the Richmond Oval 10K, the nine races in between took runners as far afield as the Sunshine Coast, south to White Rock, and north to Squamish. When all was done, 82 runners had completed 5 or more of the races, qualifying them for series prizing from Timex, Running Room, Muscle Mlk and Wholly Noggin. Special recognition went to Darrell Lahey and Dan Murphy, who completed all 11 races in the series. You are currently browsing the archives for the Road Running category.